On complex projects numerous designers are often working simultaneously on different phases and packages. 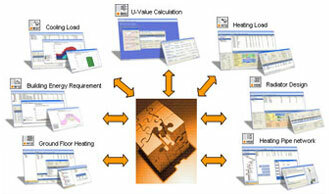 SOLAR-COMPUTER software supports this with its unique modular concept. Each module can be used as a stand-alone software, however, maximum benefits are achieved by its ability of data exchange and transfer in-between the various SOLAR-COMPUTER modules. In addition, external data (from e.g. key suppliers and manufacturers of components) can be imported into the SOLAR-COMPUTER calculation software.